13 August 2010 by J.M. The first Internet Explorer 9 beta will launch on September 15, 2010. This is what Microsoft announced in the official Internet Explorer blog. Invitations for a special event have been sent out to a selected group of web publishers, bloggers, designers and magazine editors. 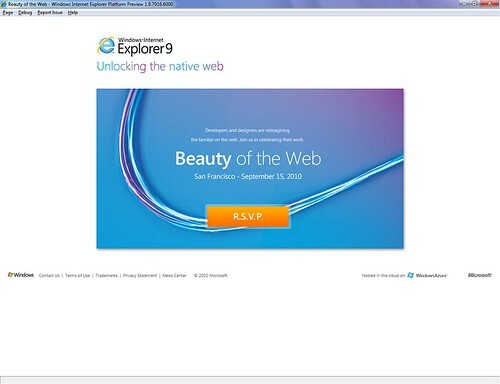 This event, Beauty of the Web, is going to take place in San Francisco on 15 September and marks the launch of the Internet Explorer 9 beta. The Technical Previews have received much positive attention, as they were downloaded more than 2.5 million times.